Kathleen Boyle was born in Hamilton but moved to Detroit as a girl. In 1930, when she was 17, she went to visit her older sister in Toronto for a few weeks. Her sister was having a baby and Kathleen wanted to support her and help her out. After being there for a week or two, she got a call on the afternoon of Thursday April 24th. It was her sister’s husband, Cecil Irving, who asked her to meet him nearby to help with a favour. When she got into his borrowed car, he told her how worried he was about their financial situation (Among other things, apparently he was worried about some hospital bills and the expenses that come with a new baby) and so he asked Boyle if she would be willing to do what it took to help them out. The always dangerous “commit before you know exactly what I’m suggesting” kind of question. So she said yes, and he then told her of his plan to stick up a local bank. Let me take a quick step back to say all this information is from newspaper articles, and so we don’t know exactly what that conversation looked like, what was going on in Kathleen’s head, or what kind of cards Cecil was playing in order to influence her involvement. Either way, it’s always a sticky situation when the desire to help your family clashes with, uh, dangerous breaking of the law. Cecil drove past his initial two targets but didn’t stop because he got intimidated by nearby cops, and they eventually parked near the Bank of Commerce branch at Dundas and Gladstone. He gave Kathleen a revolver and told her the plan. 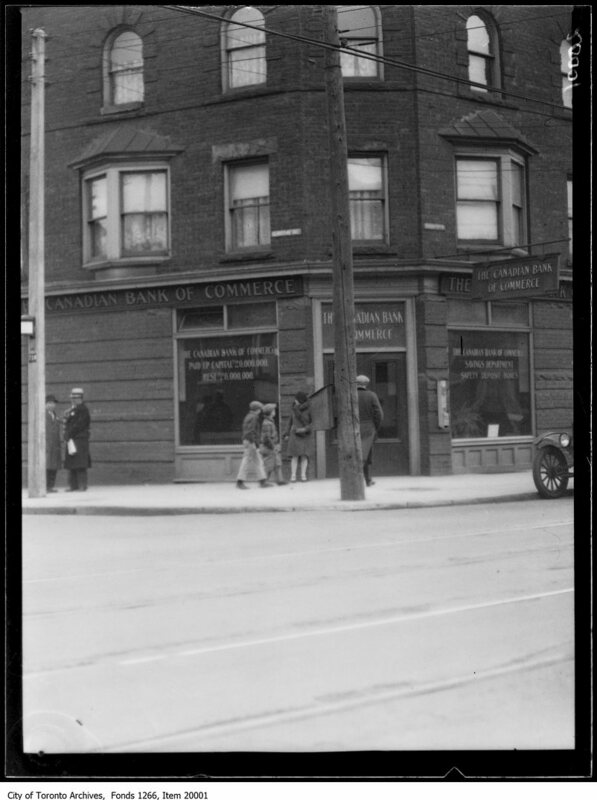 The bank at the corner of Dundas and Gladstone. She walked in and asked the teller for change for $5. As the teller was gathering the change, Cecil walked in and pulled out his sawed-off shotgun, yelling for all the staff to get into the vault. They started moving towards the vault slowly, and he fired a warning shot, which sped them up. He apparently tried to close the door but didn’t know how, so he warned them all to stay inside, saying he would fire off another shot when they were allowed to come out. As he went to grab the cash from the teller till, Kathleen stood guard at the door. A witness said she was visibly shaking as she held her revolver out. Once he had stashed the approximately $2,800 in cash (roughly $40,000 in today’s money) in his coat, they left and drove off. After ditching the car and the shotgun, they split up; Cecil went and bought a bunch of beer, Kathleen went back to her sister’s house. They were caught pretty easily, there being a number of witnesses at the bank as well as in the streets where they drove and walked. Cecil was already pretty drunk when the police found him at his friends’ house, and Kathleen was feigning sleep – apparently she initially denied she had anything to do with it, but confessed soon after. Kathleen Boyle leaving court on April 25th. 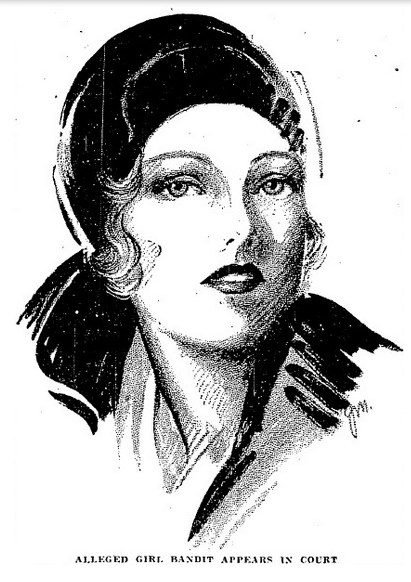 [From the Toronto Star, April 25, 1930]. The sentences were pretty harsh – the two men who were hiding Irving got two years each at Kingston penitentiary, Irving himself got 15 years and “30 straps” (!!! ), and Kathleen Boyle got 2 years. 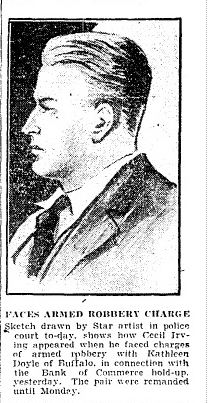 I can’t find much in the newspapers about how long Cecil Irving actually served, but Kathleen Boyle got out just under a year later, returned to Detroit, and most definitely swore off accomplice-ing bank robberies for keeps. What was most interesting to me in looking into this incident was the fact that the newspapers were so quick to jump on the fact that she was a young woman and to be super concerned with what could possible drive a proper lady to do such a thing. Even more than being inquisitive about an individual who committed a very uncommon crime for her demographic, headlines and articles were so chock full of patronizing descriptions of Kathleen Boyle. I suppose for a news organization a bank robbery is exciting enough to report on, but the fact that a teenage girl got caught up in one creates a bit of field day for them. One headline read “Toronto’s first bank holdup by bobbed-haired girl bandit.” Another said “Flapper, alleged feminine touch in commerce bank hold-up, faces charges.” Yikes. 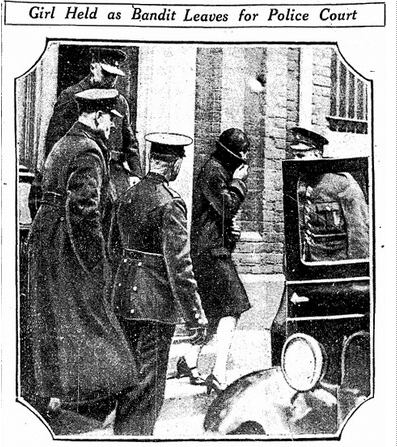 When describing the incident, articles described Irving as an “armed robber” and Boyle as a “girl bandit.” There was one article that spent a few paragraphs describing her fashionable clothing when she appeared in court, before remarking that “the expression on her face was that of a waitress waiting with slight boredom to take an order … she looked like anything in the world but a bold bandit.” Also yikes. Forgive me, but I’m about to get a bit preachy here. I think the coverage I read of this bothers me for two reasons. The first is the obvious, that this casual misogyny at least partially typifies general attitudes in Toronto at the time, which is scary and terrible. I think it also speaks to the still existing trend to not really make a place for empathy in news reporting. I understand you may argue there needs to exist some kind of attempted objectivity in the dissemination of “news,” but in a case like this there seems to be an implicit judgement of an entire person rather than a contextual description of a terrible and dangerous mistake. Clearly Cecil Irving was at the end of his rope and needed all kinds of support before he got to the point where he felt like robbing a bank with a loaded rifle was a good idea. And clearly Kathleen Boyle was a teenager who wanted to help her family and didn’t have much of a choice but to aid her brother-in-law with his ill-advised plan. Anyway, I’m not saying news organizations never aim to create sympathy for individuals or groups or that we should all send flowers and cash to the Well Dressed Bandit, and I also recognize how it’s not always productive to view history through our social lens today. But I think history is and should be about learning how to be better. And I just think it’s a shame that people’s lives are kind of at the mercy of how they’re portrayed in this kind of media. Alright, preachy-ness managed. To wrap up the actual history side of this, there you have the story of the first female charged with banditry in Toronto. Stay tuned for a more straight-up tale of swashbuckling bank robbers with no soap box at some point in the Hogtown Crier’s future. As a sidenote, check out this awesome sentence. Still true today, people! Tough to say exactly why Kathleen participated – her sister either just had or was about to have a baby, and perhaps Irving knew his wife wouldn’t encourage or support the whole bank-robbing plan. My guess is Irving guilted or scared Kathleen into it – a judge announcing her parole actually said “she was just a dupe in the hands of her brother in law.” I neglected to mention she broke down crying when she got sentenced, I imagine she was kind of in shock in her first court appearance. It’s true Irving made a whole bunch of irresponsible choices, my impression is that he kind of cracked under the pressure of being up against the wall financially, but it’s true that he probably had more options than toting a sawed off shotgun. I also fall back on the same thought about the sadness trumping the sensationalism, though. I like your soap box. It is very well-constructed.